The best time to invest was 10 years ago and the second best time is TODAY. Let me show you sample computation of what are the advantages of investing early than later. I use 20% annual growth of your investment fund for your children’s college fund. Know more about mutual fund from the link below. To better understand my computation, read my previous post below. Below are 3 different computations for your monthly investment and total amount invested starting from age 1, 5 and 10. 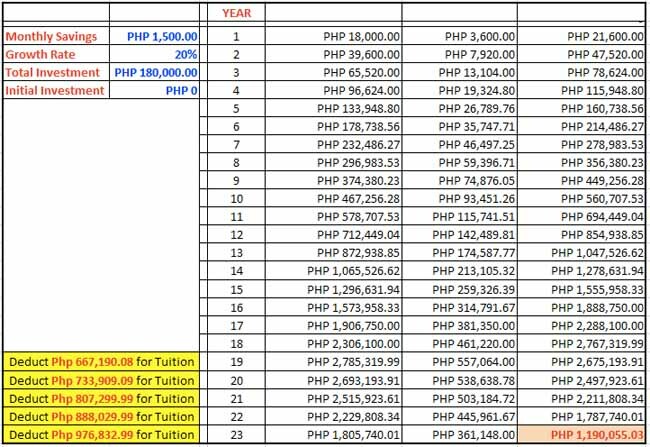 Assuming that your child will enter college at age 19. 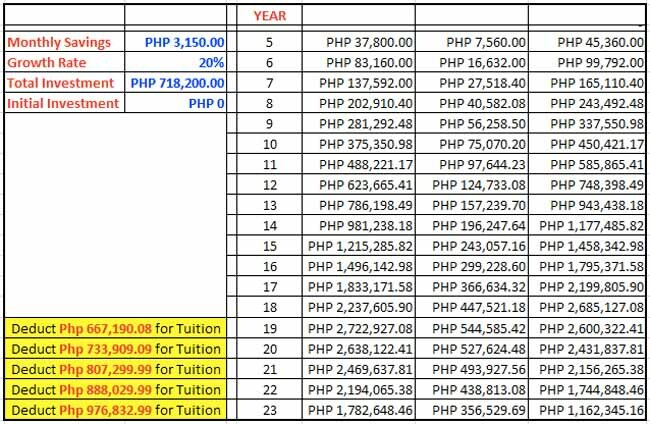 If you start investing early at first year, your monthly investment is only around PHP 1500. For the whole duration, your total investment is only PHP 180K. That will be enough to cover your child’s college fund. If you start investing at age 5, your monthly investment is around PHP 3,150. For the whole duration, your total investment is around PHP 718K. If you start investing at age 10, your monthly investment is around PHP 8,200. For the whole duration, your total investment is around PHP 1.37M. So, what age do you want to start investing for your children’s college fund?